How does one define Melbourne? For a start, as many amazing cities, it is not a city that you visit, it is a city that you breathe, eat, watch, hear, touch. Sure, they do have a Sea Life Aquarium and museums and plenty of things to fill the big tourists’ checklist. But what I could feel from only 4 days there is that the beating heart of Melbourne is hidden in the coffee shops, the dark alleys, the residential streets. The soul of Melbourne is downstairs, on the top floor, in the stadiums, in the gardens. The other reason why I have loved this city is that you feel that there are very different worlds that manage somehow to live in peace. There is an underground arty and rebel world. There is a foodie crowd eating gluten free wraps and drinking fat free lattes. There is the sporty team that jogs, surfs and plays footy. And there is all the people coming from immigration. There is no contradiction nor major conflict, they are all part of the same city and create together its culture. At last but not least, I could not stop admiring how warm, nice and genuinely friendly people from Melbourne are. Is that an Aussie characteristic or a Melbourne one? The rest of the trip will let us know. Weird? Perhaps… But the scents and fragrances have a very powerful way of getting fixed into our memory and I could feel that I could see Melbourne with my eyes shut just by following its fragrances. SO LET’S HAVE BREAKFAST, SHALL WE? Close your eyes (conceptually as otherwise you won’t be able to continue reading this post – and I would really like you to 🙂 ) and start imagining the scent of warm coffee (roasted locally of course). That powerful smell which reminds us of lazy weekend mornings has a fine palette of nuances in Melbourne. There is no way you can find a bad coffee here, even the one from the airport is good. Drinking coffee is not a hobby nor a need for a caffeine shot when you are too tired to start the day. I haven’t figured out yet if it is an art or an addiction (you just need to check out how many people on the street are carrying a take-away coffee), or both. So do not expect to find a Starbucks here, as there is no place for fast-coffee here. Going to a coffee shop is a rich experience for the client. The product is highly qualitative, the service is friendly and efficient and the environment is simply…”cool”. Back home, the happy few that combine all these characteristics are always packed, and here it is simply the norm. Why did I evoke breakfast in the subtitle? Oh yes! Because the way people have breakfast has really surprised me. In our fast-paced lives breakfast has somehow disappeared. People have a quick toast at home or get a take-away coffee that they drink at the office, in front of the computer, before the rush starts. But in Melbourne when we sat in a little cafe at 8h30 in the morning in one of the most amazing laneways I have ever been to, everybody was hanging there. Having a coffee, talking to their colleagues or friends. The arcade was simply crowded. They have managed to convince me that breakfast is the most important meal of the day. If you ever go to Melbourne, don’t miss it: head to Center Place (at the number 20 they are super friendly and the latte is delicious) or to Degraves Street (a bit fancier but less rough and less interesting) ask for a latte and try to say the impossible “G’day mate!”. 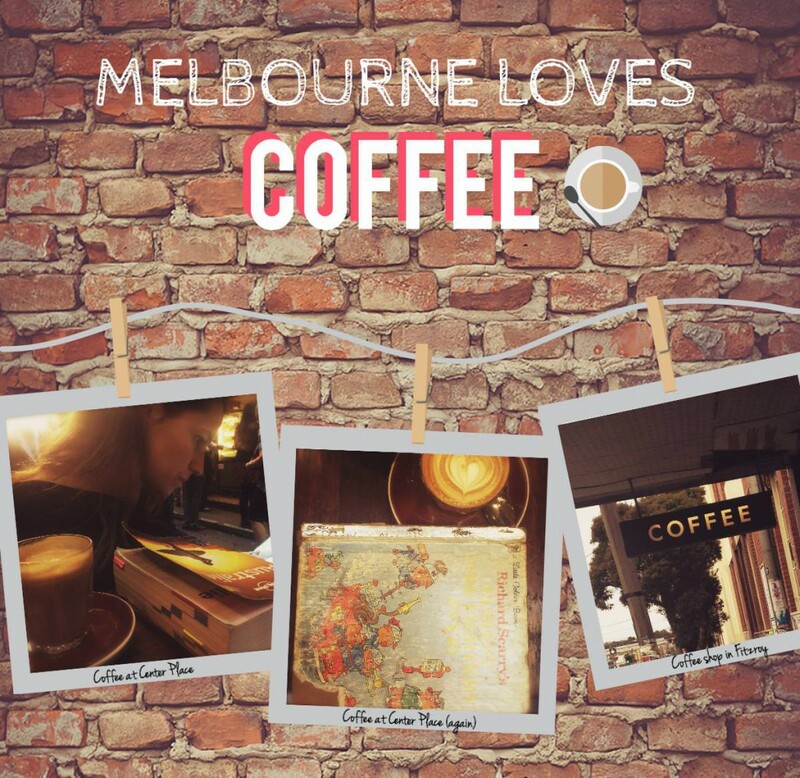 Another great option is the “hipster paradise” Fitzroy, where you can find incredible coffee shops just nearly everywhere. 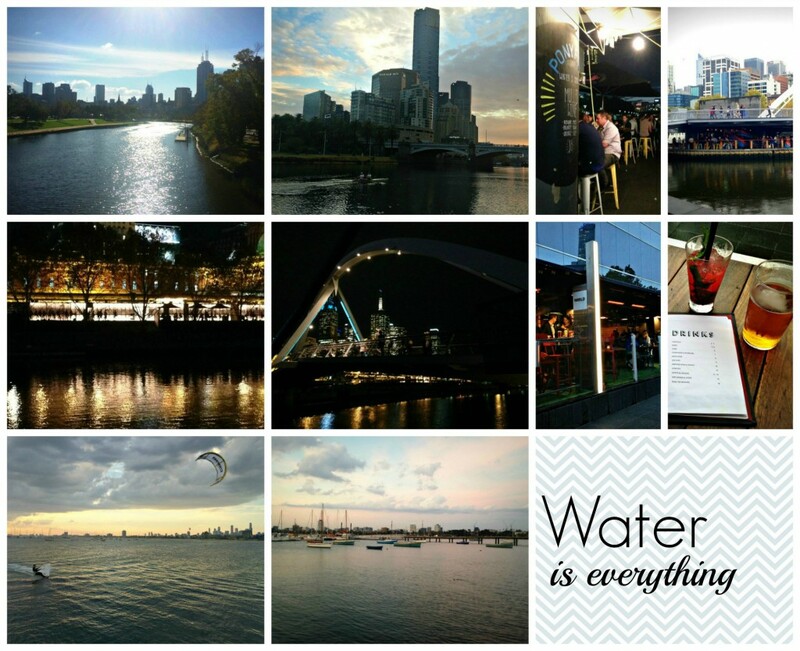 Melbourne is not just about food. It is also a story of fresh and calming scents. Melbourne is packed with beautiful gardens. 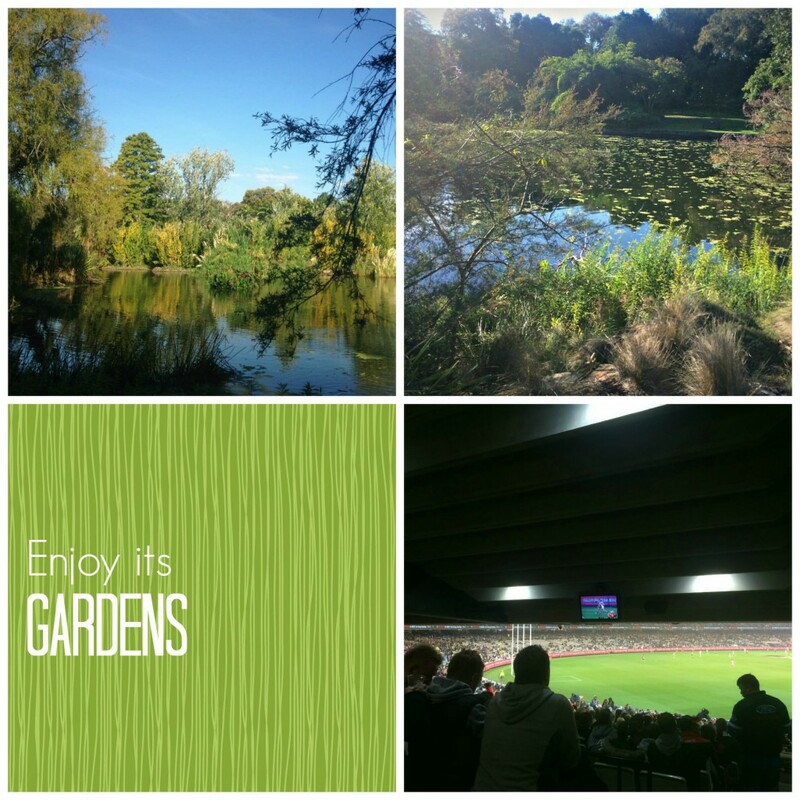 From the Royal Botanic Gardens to the Carlton Gardens, from the Parliament to the Fitzroy ones, each and every garden in this city is not only beautiful but it is also a true olfactive experience. The Royal Botanic Gardens are a must do if you want to check out what heaven could look like. Thousands of centuries-old trees, flowers, still lakes, green soft grass, a herb garden. Bring an apple, a good book from an Australian author you have never heard of, a shawl and spend some time under the shadow of a tree forgetting all the things you were supposed to do that afternoon. Get carried away by the scent of the eucalyptus and the flowers and let your brain build up an everlasting memory. But there is a last garden that has a say in Melbourne, and a big one. The Melbourne Cricket Ground of course. Going to Melbourne without paying a visit to the MCG is an incomplete experience. The national passion is not really playing cricket over there, but a weird version of rugby-American football-soccer: the “footy”! Tickets are not expensive (buy them at Ticketek, apparently they are the only one selling them) and the game is crazy! Everybody is shouting in the stadium but the whole thing is very friendly and cool. Do not worry: it will take you little time to understand how it is played. I can’t wait to see the next match! In more sunny days, follow the trail of the marine scent going down Chapel Street (a very busy retail street that is quite surprising) to hit Melbourne’s Venice Beach: Saint Kilda. In here there is no way to get bored. Saint-Kilda has a hippie-chic-arty identity that is simply too cool to ignore. You can go there for a brunch with a great coffee, than head to Luna Park for some rollercoaster rides (if your stomach can face it) and after that just relax on the beachside before going to the pier to check out if some penguins are hanging out on the rocks when the sun goes down (yes there are a lot of tourists, but the penguins are really cute… your call!). To finish the Act III of the water love story, my favorite: the Yarra River. Discover its beautiful, arty waterfront where every single bar/restaurant seems to have won an award for the best design concept of the year. Go to the Southbank and enjoy the “happy hour” advantages in one of the terraces of the numerous trendy bars. We have been to World and had a great time as well as a great drink. Going back to Flinders Street Station have a beer (or two) at Ponyfish Island, a little bar on a little island with big beers in the middle of the river. How cool is that? And if you are hungry, go for a burger at the newly opened Arbory Bar & Eatery, set in an abandoned train line with fantastic views over the river. You might even get lucky as we did and watch a rowing practice! THE FOOD MATE, THE FOOD! If you are on a diet: DO NOT GO TO MELBOURNE. It is not because there aren’t any good healthy meals, but because you will smell good food everywhere. Not the greasy junk-food type of smell, but a more refined scent of things you want to try. 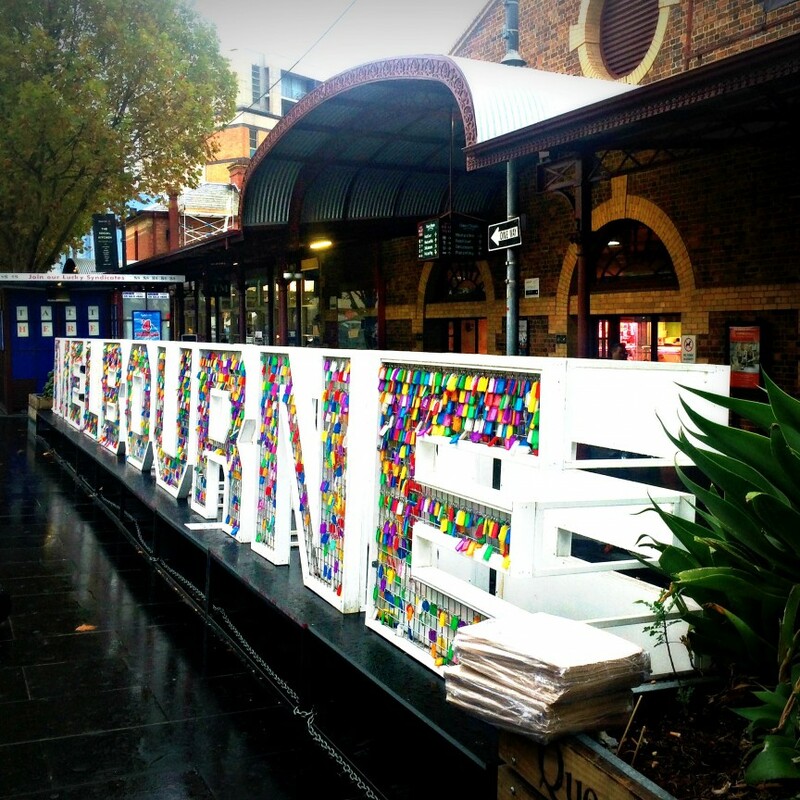 However, if you are not on a diet and you are a convinced foodie, Melbourne is a must-explore. I will write a full post on Melbourne & food so I won’t develop this point here. Why? Because from its marvelous markets to its numerous food trucks, from its Chinatown to its Greek Precinct, Melbourne hides marvels for your palate and it deserves a few extra lines. Melbourne has a smell that I wouldn’t easily associate to other cities: the smells of ink and paint. The smells of urban art. When you walk down the streets of Melbourne you realize that a lot of people are tattooed and that tattoo shops are part of the city landscape. If you were dreaming of getting one, this might be the right place to do it. As for the paint… If you are planning to go to Melbourne you might have bought your copy of the Lonely Planet Australia and you already know that street art is at the core of Melbourne’s identity. Even the billboards and posters in the street become street art. From Hosier Lane to the walls of Fitzroy the streets of Melbourne are an immense art gallery that you can visit at any time of the day (and for free – which in Australia is a big plus). Wander. Wonder. Open your eyes and make sure that you are not only taking pictures of the artworks but you are actually looking at them. 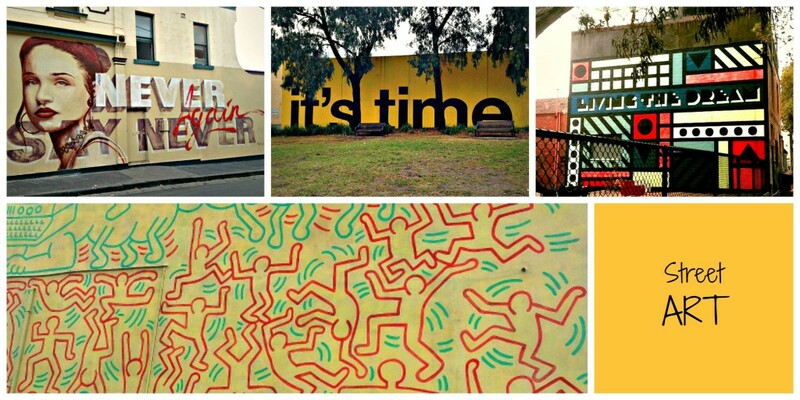 You might miss the fact that that cool wall has actually been painted by Keith Haring himself. Melbourne has not only edginess, but also sophistication. In Melbourne, more than elsewhere, I have noticed that people leave a trail of fragrance behind them. Not because they are wearing too much of it, but simply because it is their signature. You live the same experience when you go shopping in Melbourne. Every single restaurant/shop/book store has been deeply thought through and has a very personal signature. The concepts are flawless, the design is slick and every detail has a reason to be. European concept stores should come and have a look. A little highlight for 3 stores I found on my way that I loved. 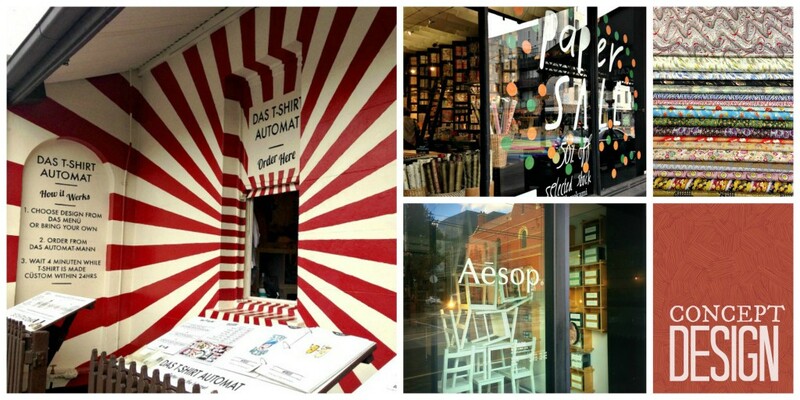 The surprising Das T-Shirt Automat prints custom T-shirts but also makes custom vinyl records. The graceful Kami on Brunswick Street (Fitzroy) is specialized on paper. Not printing paper, but beautifully crafted papers for all types of creative usages. Beautiful. As we have been talking about fragrance & design, a little tour at Aesop is also a good idea in Melbourne as it is the motherland of this plant-based laboratory-made edgy brand. To sum up, Melbourne is really an exciting city. 4 days is a good timing to visit the city, but way too short if you really want to live in it and explore it. Without a doubt it got in my top list of my favorite cities in the world. It is a city that has its arms wide open to receive tourists so a big thank you to everyone who has been so kind, attentive and helpful! Well written. By the way what did you have for breakfast? Have you tried the Greek souvlaki yet? Thanks!! Not yet, the Greek Precinct is on the schedule for Melbourne Take 2! Congrats Nath, I love your writing, makes me travel in your backpack! Have a beautiful tour of our world and keep commenting it for us! PS: A quote from “L’usage du monde” (road trip writing from 1953 I’m currently reading) : “Fainéanter dans un monde neuf est une tâche absorbante”… Love it! Nice to hearing from you again on such an adventure. 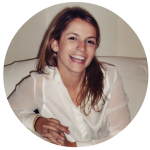 Delphine, I have loved the definition as well and it is indeed true: ´´Fainéanter dans un monde neuf est une tâche absorbante”. Amazing – you really are brilliant at making it all sound so real I almost feel like I am there – but even more I want to go!! Thanks so much for your kind words! Just made me want to write more! Sydney is coming up! Hope all is well my dear! !